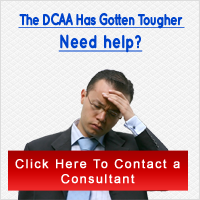 What Are DCAA Unallowable Costs? Over the years the federal government has determined that certain costs cannot be allowed in prices, cost reimbursements or settlements under contracts with the US Government. The government is unwilling to pay for these costs as direct charges to federal government contracts or through indirect expense pools applied to federal government contracts. A company is not prohibited from incurring unallowable costs, but they cannot be recovered either directly or indirectly under federal government contracts. To manage unallowable costs, separate accounts must be established for these type of expenses and they must not be priced directly into federal government contracts during the proposal process. A. Advertising Costs are allowable only if they are necessary to meet the requirements of the contract performance. B. Public Relations Costs are unallowable except for (1) costs specifically required by government contracts, (2) cost of communicating with the public and press pertaining to specific accomplishments which result from government contracts or (3) costs of conducting communication and liaison necessary to keep the public informed on matters of public concern such as notices of awards, financial matters, etc. C. Alcoholic Beverage Costs are unallowable. D. Bad Debt Costs are unallowable. E. Automobile Costs for Personal Use are unallowable. F. Defense and Prosecution of Criminal and Civil Proceedings, Claims Appeals and Patent Infringement are generally unallowable. G. Donations and contributions are unallowable. H. Entertainment Costs are unallowable. I. Executive Lobbying Costs Incurred in attempting to improperly influence either directly or indirectly an employee or officer of the Federal Government regarding a contract are unallowable. J. Fines and penalties resulting from failure of the company to comply with federal, state, local or foreign laws and regulations are unallowable. K. Goods and Services Cost for Personal Use are unallowable. M. Insurance Costs to protect against defects in materials or workmanship are unallowable. N. Interest and Investment Management Costs are unallowable except for cost related to the physical custody and control of monies and securites and for interest cost paid to external parties for assets (buildings and equipment) used to support government contracts. O. Losses on Government or Other Contracts are unallowable. P. Membership Costs in Civic, Community Organizations, Country Clubs or Social or Dining Clubs are unallowable. Q. Pre-Contract Costs, unless approved by the Contracting Agency, are unallowable. R. Airfare Travel Costs in excess of the lowest available commercial discount or standard coach airfare are unallowable.